In a world where nonprofit organizations are chronically underfunded, every dollar counts. Technology is often viewed as an overhead expense rather than an area that can help programs innovate. Microsoft’s Tech for Social Impact is designed to bridge this gap by creating solutions and offers with the specific needs of nonprofits in mind. It’s our mission. It’s our passion. At the core of any nonprofit are fundraising and operations. So last November we launched the Dynamics 365 Nonprofit Accelerator, a suite of solutions designed to drive deeper programmatic engagement and help nonprofits achieve greater impact. 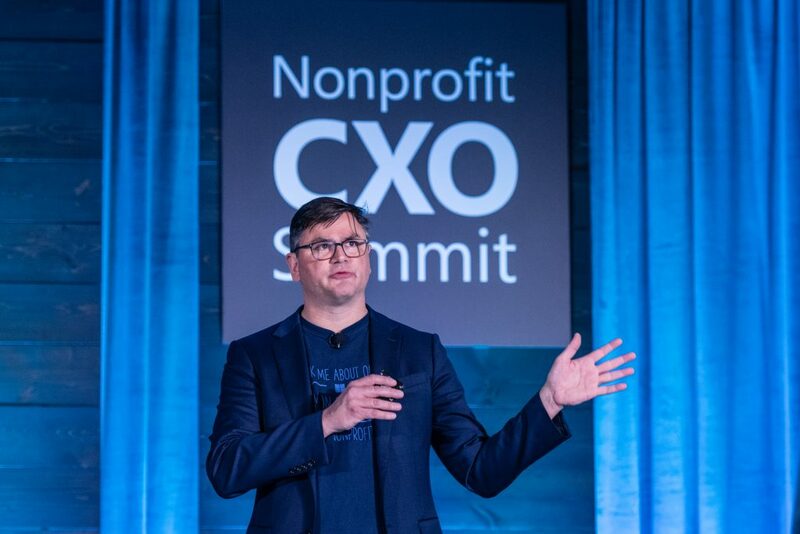 Last week at the Microsoft Nonprofit CXO Summit, we announced the next chapter of this platform: the Dynamics 365 Nonprofit Accelerator v2, created in collaboration with nonprofits, partners, and sector experts worldwide. For v2, we’ve dramatically enhanced the Nonprofit Accelerator itself and the underlying Common Data Model (CDM) to unleash a wealth of new capabilities and standards for nonprofits and the growing ecosystem of partners who serve them. Central to our approach is our commitment to building a CDM, publishing that openly, and working across platforms. This enables powerful interoperability to fuel greater insights and efficacy, while also providing true data transparency. Microsoft has long been committed to open data, and we believe this approach is key to driving innovation in the sector. The v2 doubles the size of the CDM. Last year we delivered 35 different entities with about 700 attributes. With v2, we’ve grown the model to 75 entities with 1,400 attributes. These entities and attributes represent sector-specific data elements, relationships, and best practices as defined by Microsoft, our partners, and a group of nonprofit experts. The CDM also includes the International Aid Transparency Initiative (IATI) Organization and Activity standards, which we have made available via GitHub. Not all nonprofits subscribe to IATI, but for many organizations working with institutional donors or government agencies, it’s a requirement. Recognizing this, we made the IATI modeling available as an add-on so organizations have the freedom to choose whether to add it to their solutions. Microsoft is the first and biggest consumer of the CDM and has incorporated all the best practices the CDM represents into Dynamics 365 through the Dynamics 365 Nonprofit Accelerator. We are committed to helping nonprofits around the world implement these best practices consistently and efficiently. By incorporating the CDM into the Accelerator, what once required customization is standard today, with the schema included in your Dynamics 365 subscription. The interoperability afforded by the CDM is also driving an ecosystem of partner solutions. 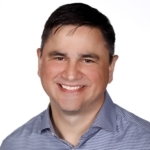 Since launch, we’ve grown from 14 to 40 global partners, including companies such as Avanade and Blackbaud, and new start-ups like threshold.world, that are committed to contributing to the CDM and creating purpose-built solutions on Dynamics 365 to spur innovation, interoperability, and impact. The list of partners includes global solutions integrators like Ernst & Young that have helped create some of the sample applications. And we’ve seen a new wave of partners that are not only consuming the model but that are also committed to improving it, including partners that haven’t been closely associated with the Microsoft ecosystem in the past, like Blackbaud, Classy, Fluxx, Jackson River, and Social Solutions Global. To facilitate this interoperability, we’ve invested in mapping templates to make it easy for partners to map their own data schemas to the CDM. Many partners already have done this and are invested in aligning to this standard including Blackbaud’s Luminate Online, Classy’s fundraising suite, Fluxx’s grant management suite, Jackson River’s Springboard platform, and VolunteerMatch’s recruiting solutions. In addition, to help organizations quickly get started putting their data to use across platforms, Microsoft has invested in mapping the CDM to the Salesforce Nonprofit Success Pack. We are committed to this as a sector-wide standard, so it’s encouraging to see a broad range of solutions partners adopt the CDM and Accelerator, such as AKA Enterprise Solutions, Flores.nl, lfunds, m-hance, MISSION CRM, QUANTIQ, StratusLive, VolunteerMatch, Wipfli, and others that have already engaged nonprofits to implement the solution. We think the groundswell of support we’ve seen since our initial launch just a few short months ago speaks to the power of the platform, as well as customers like International Rescue Committee, Leonard Cheshire, SOS Children’s Villages, Team Rubicon and many others that have made the decision to adopt the Dynamics 365 Nonprofit Accelerator. We want to go beyond building new technology. Tapping the experiences, expertise, and needs of thousands of nonprofits around the world, we aim to optimize best practices and implementation, and help them unlock the richness of their data as quickly as possible. In the coming months, we’ll have more updates to the platform. Working with partners, we are committed to helping nonprofits with legacy Microsoft Dynamics implementations, as well as building out both the Dynamics functionality and the underlying CDM with updates coming out quarterly. 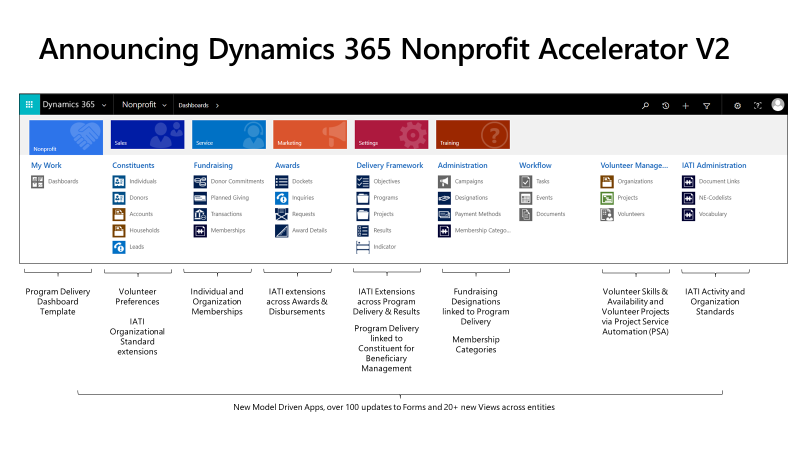 Customers and partners can download the Dynamics 365 Nonprofit Accelerator via AppSource. Take it for a test drive—and then let us know what you think. Members of the nonprofit community can contribute to the offering via the Dynamics 365 Insider Program.